Normally these mission dossiers are ultra high tech, so it’s nice to see something this retro as the delivery system for the message. And I absolutely loved the jazz history lesson. “Saving the Western Hemisphere.” Ha! “Today’s the day when the IMFs luck runs out.” Time to go rogue. And by luck, Alec Baldwin’s character means funding….and government sanctioning. Minor speed bumps. OMG! The way Hunt works his way up the pole is one of the most amazing things I’ve ever seen. And the fact that Cruise did this stunt himself is uber-impressive. “Welcome to the CIA.” No thanks. Robert Culp’s character on The Greatest American Hero once referred to the CIA as “Creeps in Action.” Aptly put, especially in this film. “You want drama, go to the opera?” Must I? Although, this is certainly the liveliest opera I’ve ever seen (on the big screen). An amazing backstage brawl, debris raining down onto the set and a thwarted assassination attempt all combine to make this an unforgettable sequence. To say nothing of the obvious rifle as phallus imagery. The bow tie’s coming off. Here we go! Two assassins. Who to shoot? C’mon, you know Ethan isn’t going to shoot the smokin’ hot babe. “Change of plans. Throw her out.” Ha! One of the funniest moments/lines in the film. Bond has SPECTRE, Marvel has Hydra, etc. Same dif. A digital safety deposit box. A clever concept as long as you don’t get hacked. A throwaway line that riffs on the title. Good for a titter and a line for Twitter, but not much else. Ethan jumps into a water singularity that looks like a giant woofer on a speaker. Either that or a monochromatic version of the Looney Tunes opener. The moment would’ve played far better if this was Pegg’s first film in the series. As things are, his standard shtick inspires courtesy chortles rather than uproarious guffaws. One of the most pulse pounding motorcycle pursuits ever committed to film. And I love that shirt Cruise is wearing. Where can I purchase one? “There are no allies in statecraft.” No honor among thieves either. This is one of my favorite lines in the film. It feels like it was lifted right out of a Le Carre novel. I debated over whether or not to Tweet this, due to its appropriateness, but it’s the only favorite I got for this movie so #GoodGamble. “Come away with me.” I really like #Option3. A woman like that wouldn’t have to ask me twice. “That Syndicate.” There’s more than one? A nice twist on the phrase and a fitting one for this actioner. A rousing scene that’s more than a little reminiscent of the superhero team shot in The Avengers. Final analysis: a decent addition to the series that has solid action, but little heart. I never once felt connected to anything in the story. The tame romance isn’t the least bit compelling, nor is the standard issue IMF under siege by a secret organization with nefarious motives subplot. There’s nothing new here and even the action sequences seem predictable and passé. Rating: 2 1/2 out of 4. A mild disappointment, but only because 1, 3 & 4 were so superb. 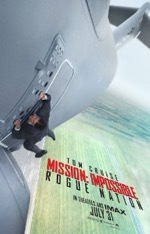 The trailer for this fifth Mission Impossible movie showcases a few choice clips of Ethan Hunt (Tom Cruise) holding on to the side of an ascending jet in a death-defying stunt. Hunt yells for his tech assistant, Benji (Simon Pegg), to open the door so that he can enter the plane before being blown clear by rapidly increasing wind shears. Benji opens the wrong door, which generates laughter from the audience, and we’re on to the next high-octane scene in the two minute promo for the film. In the actual movie, this sequence serves as the opener and is a standalone action segment that has nothing to do with the rest of the film. The nail biting, physics fudging plane-hang is there simply to grab the audience’s attention from the start and to set the pace and tone for the rest of this action packed summer blockbuster. The episodic opener is reminiscent of the M:I TV series, which would occasionally use cliffhangers as intros to episodes (Alias did this extensively as well). The problem here is that the “hanging from a jet” set piece is the finest action sequence in the film—with the underwater and motorcycle scenes coming in a close second. I contend that the opening passage should’ve been employed as the climactic action piece and integrated into the narrative. As things stand, this opener is an exciting, yet utterly meaningless, midair spectacle that’s ultimately a missed opportunity, an egregious misappropriation of energies and a self-indulgent exercise by writer/director Christopher McQuarrie. As for the rest of the action scenes, they’re well choreographed and executed, but they aren’t nearly as spectacular as the ones exhibited in the last two M:I films. Though the underwater sequence gets props for being the most ambitious and creative action beat in the film, the motorcycle chase, though pulse-pounding, isn’t all that much better than what we’ve seen in the Bourne or modern Bond movies. The story is serviceable but has some noticeable deficits: there’s very little genuine jeopardy (since we know that none of the main characters are going to die), the villain is mediocre and the so-called romance between Hunt and Ilsa (Rebecca Ferguson) is painfully tepid. Cruise, fittingly, coasts through the plot as if on cruise control, but doesn’t bring anything new to his character beyond what’s already been established in the earlier movies. As for the rest of the cast, Pegg is predictably comedic, Jeremy Renner hits his marks but is disappointingly perfunctory and Ving Rhames is nothing more than an ambulatory cardboard standup of his character. Of the new additions to the cast, Ferguson is far better in her action scenes than in her acting scenes and Alec Baldwin, though a bit stiff as the suit with shifting loyalties, delivers the only true standout performance in the film. Bottom line: Rogue boasts some frenetic action scenes, decent acting and a mildly diverting story. However, beyond those few elements, there’s little else to recommend the film. While Rogue is still a giant fulcrum swing better than M:I II, it doesn’t even come close to the quality of the other films in the series. Though it’s hard to put a finger on what inhibits the film the most, there’s definitely something lacking here. Let’s hope Paramount Pictures discovers that missing ingredient before approving the next mission.